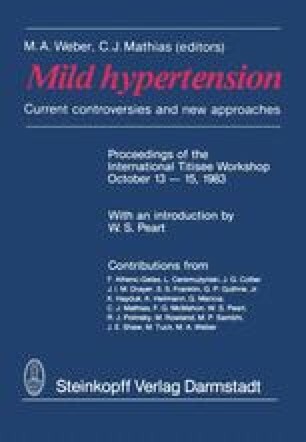 An increase in the activity of the adrenergic nervous system is one of the features of mild hypertension and is thought to contribute to the mechanism of the disease (De Quatro and Chan 1972; Champlain et al. 1981). Both hypertension and augmented sympathetic drive help to produce the symptoms of angina pectoris by increasing af-terload and accelerating metabolic rate, respectively. Each of these mechanisms raises the oxygen demand of the heart muscle and is likely to lead to a shortage of oxygen, which is known to trigger coronary pain.